The name “Dino Bravo” was taken from a wrestler from the late 50s, who was the Original Dino Bravo (Pepe DiPasquali)..
1970: Dino Bravo began his wrestling career in Montreal, where he would eventually become a legendary sport figure..
Dino Bravo was initially billed as the cousin of Gino Brito, his tag partner, in Montreal’s Grand Prix promotion..
1970s: Dino Bravo wrestled in the Los Angeles and Mid-Atlantic territories to gain exposure and experience..
1977: Dino Bravo went to work for the World Wide Wrestling Federation, but later quit and returned to Canada..
1978: Dino Bravo won the inaugural tournament for Frank Tunney’s NWA Canadian title which was presented by Whipper Watson..
1980s: Dino Bravo was the lead wrestler and co-promoter (along with Gino Brito & Frank Valois) of the Montreal promotion..
1985: Dino Bravo rejoined the World Wrestling Federation..
January 1986: A rumored incident occured when a WWF Montreal show with Hogan vs Bravo was advertised was cancelled..
~~~This was at the last minute with 20,000 fans in their seats simply because the WWF did not want Hulk Hogan booed..
March 1987: Dino Bravo reinvented himself as a bleeched blonde heel managed by Frenchy Martin..
April 1987: Dino Bravo formed a tag team with Greg “the Hammer” Valentine, called Dream Team II..
December 27, 1987 – Wrestling Challenge: Dino Bravo defeated Jerry Allen. January 24, 1988 – Wrestling Challenge: Dino Bravo defeated WG Wellington. January 24, 1988 – Royal Rumble: Dino Bravo successfully bench pressed “715 pounds” with Jesse Ventura spotting (and obviously helping).. Dino Bravo was in the Royal Rumble won by Jim Duggan. Dino Bravo began calling himself “The World’s Strongest Man” but later downgraded to “Canada‘s Strongest Man”..
January 30, 1988 – Superstars: Dino Bravo defeated WG Wellington. February 20, 1988 – Superstars: Dino Bravo defeated David Stoudemire. February 21, 1988 – Wrestling Challenge: Dino Bravo defeated Phil Newkirk. March 12, 1988 – Superstars: Dino Bravo defeated Jonnie Stewart. March 13, 1988 – Wrestling Challenge: Dino Bravo defeated Gary Jackson. March 27, 1988 – WrestleMania IV: Don Muraco defeated Dino Bravo by disqualification in the 1st round. April 9, 1988 – Superstars: Dino Bravo defeated Reno Riggins. April 24, 1988 – Wrestling Challenge: Dino Bravo defeated Omar Atlas. April 30, 1988 – Superstars: Dino Bravo defeated Nelson Veilleux. May 27, 1988 – MSG Network: Dino Bravo defeated Ken Patera. June 4, 1988 – Superstars: Dino Bravo defeated Frank DeFalco. June 26, 1988 – Wrestling Challenge: Dino Bravo defeated Frank Valdez. July 2, 1988 – Superstars: Dino Bravo defeated Bill Johnson. July 16, 1988 – Superstars: Dino Bravo defeated Tony Parks. July 31, 1988 – Wrestling Challenge: Dino Bravo defeated Sam Houston in a dark match. Dino Bravo defeated John Yates. July 31, 1988 – WrestleFest: Dino Bravo defeated Ken Patera. August 13, 1988 – Superstars: Dino Bravo defeated Chris Zarna. August 21, 1988 – Wrestling Challenge: Dino Bravo defeated Frank Valdez. August 29, 1988 – SummerSlam: Dino Bravo defeated Don Muraco. September 3, 1988 – Superstars: Dino Bravo defeated Don Driggers. 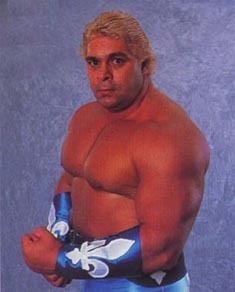 September 11, 1988 – Wrestling Challenge: Dino Bravo defeated Tito Santana by count-out in a dark match. September 17, 1988 – Superstars: Dino Bravo defeated Mario Mancini. September 25, 1988 – Wrestling Challenge: Dino Bravo defeated Dave Paradise. September 28, 1988 – MSG Network: Dino Bravo defeated B. Brian Blair. October 8, 1988 – Superstars: Dino Bravo defeated John Latu. October 16, 1988 – Wrestling Challenge: Dino Bravo defeated Tommy Angel. October 16, 1988 – King of the Ring: Jim Duggan defeated Dino Bravo in a flag match. October 24, 1988 – MSG Network: Dino Bravo defeated Jim Duggan by count-out. October 29, 1988 – Saturday Night Main Event: Dino Bravo defeated Ken Patera. November 5, 1988 – Superstars: Dino Bravo defeated Jim Evans. November 6, 1988 – Wrestling Challenge: Dino Bravo defeated Reno Riggins. November 24, 1988 – Survivor Series: Andre The Giant, Dino Bravo, Harley Race, Mr. Perfect and Rick Rude defeated Jake Roberts, Jim Duggan, Ken Patera, Scott Casey and Tito Santana in a tag team elimination match. November 26, 1988 – Saturday Night Main Event: Dino Bravo defeated Jim Gorman and Stephan de Leon in a handicap match. December 25, 1988 – Wrestling Challenge: Dino Bravo defeated Mario Mancini. December 30, 1988 – MSG Network: Jim Duggan defeated Dino Bravo in a flag match. January 6, 1989 – House Show in Montreal: Hulk Hogan & Jim Duggan & Ron Garvin defeated The Rougeaus & Dino Bravo by DQ..
~~~Dino Bravo was disqualified for not releasing the Bearhug on Hulk Hogan, who was taken away from the ring on a stretcher! January 14, 1989 – Superstars: Dino Bravo defeated Omar Atlas. January 15, 1989 – Royal Rumble: Jim Duggan & The Hart Foundation (Bret Hart & Jim Neidhart) defeated Dino Bravo & The Fabulous Rougeaus (Jacques Rougeau & Raymond Rougeau) in a best 2 out of 3 falls match. February 18, 1989 – Superstars: Dino Bravo defeated Mark Ming. March 18, 1989 – MSG Network: Jim Duggan & The Bushwhackers (Butch & Luke) defeated Dino Bravo & The Fabulous Rougeaus (Jacques Rougeau & Raymond Rougeau). March 25, 1989 – Superstars: Dino Bravo defeated Louie Spicolli. April 2, 1989 – WrestleMania V: Dino Bravo defeated Ronnie Garvin. April 9, 1989 – Wrestling Challenge: Dino Bravo defeated Jim Evans. April 29, 1989 – Superstars: Dino Bravo defeated Brian Johnson. May 21, 1989 – Wrestling Challenge: Dino Bravo defeated Scott Colton. May 27, 1989 – Superstars: Dino Bravo defeated Warren Bianchi. June 18, 1989 – Wrestling Challenge: Dino Bravo defeated Frankie DeFalco. July 2, 1989 – Wrestling Challenge: Dino Bravo defeated Ron Fails. July 8, 1989 – Superstars: Brad Perry defeated Dino Bravo by disqualification. July 30, 1989 – Wrestling Challenge: Dino Bravo defeated Dale Wolfe. August 12, 1989 – Superstars: Dino Bravo defeated Brian Johnson. August 28, 1989 – SummerSlam: Dino Bravo defeated Koko B. Ware in a dark match. September 23, 1989 – Superstars: Dino Bravo defeated Tony Diamond. October 10, 1989 – Sky One: Dino Bravo defeated Bret “Hitman” Hart in a match that took place in the United Kingdom..
October 15, 1989 – Wrestling Challenge: Dino Bravo defeated Red Tyler. October 21, 1989 – Superstars: Dino Bravo defeated Jim Evans. October 28, 1989 – MSG Network: Bret Hart vs. Dino Bravo ended in a time limit draw. October 28, 1989 – Superstars: Dino Bravo defeated Mark Regan. November 5, 1989 – Wrestling Challenge: Dino Bravo defeated Dale Wolfe. Vince from the UK wrote: Hi i am a wrestling fan who was there for that event with my brother, just thought that i’d let you know that the Dino Bravo vs Bret Hart match did end with Bravo pinning Bret. During the break only in the arena the referee reversed the decision and awarded the match to Bret via DQ. I hope I have been of help. Cheers Vince. 1990-91: Dino Bravo joined forces with Earthquake (John Tenta) and went after The Ultimate Warrior..
November 23, 1989 – Survivor Series: The King’s Court (Dino Bravo, Earthquake, Greg Valentine & Randy Savage) defeated The 4x4s (Bret Hart, Hercules, Jim Duggan & Ronnie Garvin) in a tag team elimination match. November 25, 1989 – MSG Network: Dino Bravo defeated Hercules. November 25, 1989 – Superstars: Dino Bravo defeated Tom Fuller. December 3, 1989 – Wrestling Challenge: Dino Bravo defeated Paul Roma. December 16, 1989 – Superstars: Dino Bravo defeated Scott Colton. December 24, 1989 – Wrestling Challenge: Dino Bravo defeated Randy Fox. December 30, 1989 – Superstars: Dino Bravo defeated Reno Riggins by DQ. January 7, 1990 – Wrestling Challenge: Dino Bravo defeated Dale Wolfe. January 20, 1990 – Superstars: Dino Bravo defeated Alan Reynolds. January 21, 1990 – Royal Rumble: Dino Bravo was in the Royal Rumble match won by Hulk Hogan. January 27, 1990 – Saturday Night Main Event: Dino Bravo defeated Ronnie Garvin. February 4, 1990 – Wrestling Challenge: Dino Bravo defeated Tito Santana by count-out. February 10, 1990 – Superstars: Dino Bravo defeated Terry Bronson. February 18, 1990 – Wrestling Challenge: Dino Bravo defeated Scotty Williams. March 10, 1990 – Superstars: Hulk Hogan defeated Dino Bravo. March 25, 1990 – Wrestling Challenge: Dino Bravo defeated Riki Ataki. April 1, 1990 – WrestleMania IV: Jim Duggan defeated Dino Bravo. April 7, 1990 – Superstars: Dino Bravo defeated Stephan de Leon. April 15, 1990 – Wrestling Challenge: Dino Bravo defeated Jim Long. April 28, 1990 – Superstars: Dino Bravo defeated Mitch Ryder. April 30, 1990 – MSG Network: Dino Bravo defeated The Red Rooster. May 12, 1990 – Superstars: Brutus Beefcake vs. Dino Bravo in the quarter-finals ended in a double disqualification. May 27, 1990 – Wrestling Challenge: Dino Bravo defeated Louie Spicolli. June 2, 1990 – Superstars: Dino Bravo defeated George Anderson. June 23, 1990 – Superstars: Dino Bravo defeated Tony Ulysses. July 8, 1990 – Wrestling Challenge: Dino Bravo defeated Jim Powers. July 21, 1990 – Superstars: Dino Bravo defeated Paul Roma. July 29, 1990 – Wrestling Challenge: Dino Bravo defeated Mike Falcon. September 9, 1990 – Wrestling Challenge: Dino Bravo defeated Jim Bruznell. October 6, 1990 – Superstars: Dino Bravo defeated Kevin Krueger. October 19, 1990 – MSG Network: Tugboat defeated Dino Bravo by DQ. November 4, 1990 – Wrestling Challenge: Dino Bravo defeated Gary Jackson. November 22, 1990 – Survivor Series: The Hulkamaniacs (Hulk Hogan, Jim Duggan, The Big Boss Man & Tugboat) defeated The Natural Disasters (Dino Bravo, Earthquake, Haku & The Barbarian) in a tag team elimination match. December 23, 1990 – Wrestling Challenge: Dino Bravo defeated Glen Ruth. December 28, 1990 – MSG Network: Hulk Hogan & Tugboat defeated Dino Bravo & Earthquake. January 19, 1991 – Royal Rumble: Dino Bravo was in the Royal Rumble match won by Hulk Hogan. January 20, 1991 – Wrestling Challenge: Dino Bravo defeated Ray Palmer. January 21, 1991 – MSG Network: Greg Valentine defeated Dino Bravo. February 9, 1991 – Superstars: Davey Boy Smith defeated Dino Bravo in a dark match. February 24, 1991 – Wrestling Challenge: Greg Valentine defeated Dino Bravo by disqualification. March 15, 1991 – MSG Network: The Hart Foundation (Bret Hart & Jim Neidhart) defeated Dino Bravo & Earthquake to retain the world tag titles. March 24, 1991 – WrestleMania VII: The Texas Tornado defeated Dino Bravo. July 1, 1991 – MSG Network: Dino Bravo defeated Shane Douglas. July 6, 1991 – WWC: Dino Bravo defeated Carlos Colon by disqualification. Carlos Colon retains the Universal title. December 1992: WWF scheduled a retirement show for Dino Bravo at the Montreal Forum but it was cancelled. March 11, 1993: Adolfo Bresciano (age 44) was murdered by gunshot due to rumored involvement with organized crime in Montreal. ~~~Dino Bravo’s execution (seven gunshots, at least two to the head) was reportedly linked to a cigarette smuggling cartel..